Tom Cruise plays race driver Cole Trickle, whose talent and ambition are surpassed only by his burning need to win. Discovered by businessman Tim Daland (Randy Quaid), Cole is teamed with legendary crew chief and car-builder Harry Hogge (Academy Award. winner Robert Duvall) to race for the Winston Cup at the Daytona 500. A fiery crash nearly ends Cole's career and he must turn to a beautiful doctor (Nicole Kidman) to regain his nerve and the true courage needed to race, to win and to live. 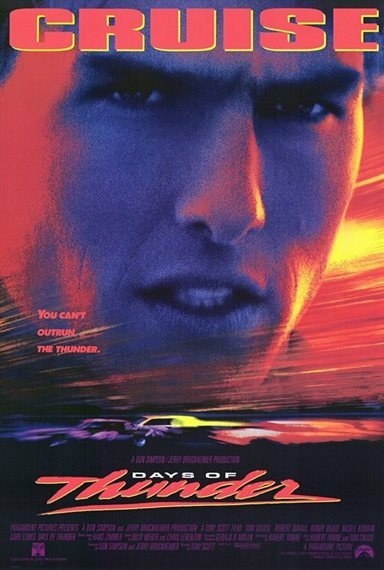 Download Days of Thunder in Digital HD from the iTunes store. Days of Thunder images are © Paramount Pictures. All Rights Reserved.